Ibrahim Khalil Jewel: A high-level delegation comprising ILO, SIDA, CEBAI, H&M and Bangladesh Govt officials visited the garment training center at Bea-Con Knit Wear Ltd (Bea-Con-2 RTO), situated at South Salna in Gazipur on 16 August, 2017. The training center was established with the aim of train up the newcomers to the RMG industry and make them skilled quality workers. Its main goal is to meet up the workers demand in the RMG factories and reducing unemployment among the able workforce in the society. It is mentionable here that Bea-Con Knit Wear Ltd is a sister concern of Metro Knitting & Dyeing Mills Limited. Managing Director of Metro Knitting & Dyeing Mills Ltd Mr. Amal Podder CIP welcomed the delegation team and took part in a discussion with them regarding the performance of his training center. He added that he would establish such kind of training centers at his other factories also as a part of Corporate Social Responsibility (CSR) with the association of concerned stakeholders. In response to a query by the visiting team, Mr. Amal Podder opined that the initiative to introduce such type of training centers in other RMG factories of the country is very possible if the stakeholders give financial supports to the owners. He is very much eager to see that other factories of the industry come up with this initiative for the greater interest of the apparel industry, which is the lifeline of Bangladesh's economy. The delegation includes the high officials: Ylva Sahlstrand, Second Secretary, Human Rights, Embassy of Sweden; Majeda Haq, Programme Officer, Private Sector Development, Embassy of Sweden [Both of them as representatives of SIDA]; Brig. General Aftab Uddin Ahmad (Retd), CEO, CEBAI; Khadija Khondker, Programme Officer, ILO Country Office for Bangladesh; Dr. Md. Shah Alam Majumder, Specialist (Course Accreditation), NTVQF Cell, Bangladesh Technical Education Board (BTEB); Prodip Gabriel Sku, Sustainability Project Leader, H&M, Bangladesh; SM Jahangir Alam, Consultant, ILO COE Project. 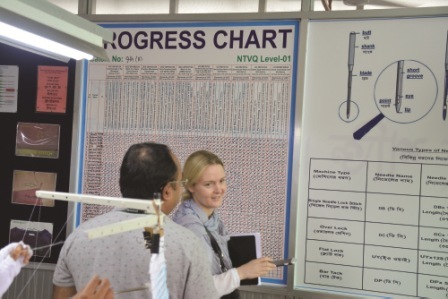 Before starting visiting the training center floor, a digital presentation was given to them over the performance and achievement of the training centre as well as overall performance, production capacity, export volume and other achievements of Metro Knitting and Dyeing Mills Ltd by the Senior AGM (Corporate) of Metro Knitting & Dyeing Mills Ltd Amit K. Biswas. The high officials visited the training center and highly praised observing the total activities. They visited the floor, inspected the machines and instruments that are being used in giving training; they talked to the trainees and regular workers who have got job after completing training here. 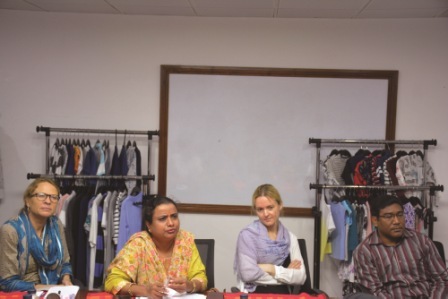 Expressing profound satisfaction, the visiting team mentioned that the initiative would create Positive Image on Bangladesh’s garment industry as well as on Bea-Con Knit Wear among the foreign brands who buy RMG products from Bangladesh. General Manager (Admin, HR & Compliance), Corporate of Metro Knitting and Dyeing Mills Ltd Atiqul Islam, Senior Manager Technical (Corporate) of Metro Knitting and Dyeing Mills Ltd Uttam Sarker, General Manager (Production & Planning) of Bea-Con Knit Wear Mr. Kapila Perera, Deputy General Manager (Production) of Bea-Con Knit Wear Haider Ali Lashkar, Manager (HR, Admin & Compliance) of Bea-Con Knit Wear (factory-2) Sanjoy Paul among others were present during the visit. The trainees informed the visiting team that they are getting proper learning here to become a competent apparel worker. During the training, each of them are getting Tk 5,300 monthly as allowances and after completion of the three-months training, they get job as regular employees and their salaries are fixed as per the company rule guided by the labour law of the country, which is very satisfactory, according to the workers. After the visiting, THE APPAREL NEWS team took interviews of the delegation members. The Apparel News: What’s your evaluation regarding today’s visit? Ylva Sahlstrand: First reflection being here in short time— it could be said very nice; seem to learn a lot to go ahead to their duties, for example- machine operator that look for a good. The Apparel News: How do you see the initiative Bea-Con Knitwear has taken to train the workers? Ylva Sahlstrand: I think this is a good example that could be disseminated and to have big discussion around different stakeholders, on the govt side, owners of factories, brands and other partners as well. I think we have to struggle to reach the Sustainable Development Goal (SDG) all together to make decent work places so that all together this could an example one step to make better work place for the workers. The Apparel News: Do you have any message for the entrepreneurs of Bangladesh’s apparel sector? Ylva Sahlstrand: Well, one think that training for the workers to have better skills, which is very important but it also should be linked to other important issues around the sustainability for a sustainable world, I think. But this is a good step to spread the works and highlight this in different forum I would say. The Apparel News: Do you find the Bea-Con Knitwear’s initiative a positive one? Ylva Sahlstrand: It’s an initiative but could be disseminated and discussed. Yes, for sure and we are highly interested to follow the future of training also. The Apparel News: How did you observe today the performance of training center of Bea-Con Knitwear Ltd? Khadija Khondker: This was a great initiative that Bea-Con has taken over to support its staff for the skill development and they have already taken it on board to introduce in other factories as well. This is very well-established training center, which is extremely organized. The workers who have been benefited from the training, offered by Bea-Con and with the certification of Bangladesh Technical Education Board (BTEB) and the support of ILO Bangladesh have actually clearly shown the confidence about taking up new responsibility, and really giving something back to this factory of Bea-Con. The Apparel News: Are you satisfied to see the Bea-Con training center? Do you have any suggestion to improve the training quality? Khadija Khondker: Absolutely fully satisfied. And obviously all our initiatives have a concern about sustainability, Bea-Con in this regard has very clearly shown that they have taken it as a sustainable model. They have already introduced this in two other factories. Only one suggestion that I have already put forward to the top management of Bea-Con that in perspective of business, skill development is important because it actually has direct benefit to the workers but it also has strong contribution to the productivity improvement of the factory itself. She also opined that other factories of the country should follow the example of Bea-Con. The Apparel News: What’s your evaluation on today’s visit? Brig Gen Aftab Uddin Ahmad: I think the visit today was wonderful. We had our donor partner SIDA, we had the representatives from ILO, and they are very pleased with what the industry is doing for the training of the RMG workers. The Apparel News: You are the CEO of CEBAI, whose one of the important jobs is to develop skilled human resources for the apparel sector of Bangladesh. In perspective of this how do you evaluate the initiative of Bea-Con training center? Brig Gen Aftab Uddin Ahmad: The initiative that was taken at the insistence of ILO “To Train Your Workers Within the Industry” is very Positive and very Imaginative. The Apparel News: Today you have visited the training center of Bea-Con. What’s your evaluation? Dr. Md. Shah Alam Majumder: Excellent. Actually I was involved in the accreditation process of this institute. In that time, I found it quite fine, but now today I found it very much fantastic. There is lot of improvements here in Bea-Con training center and skill development of the workers through this center is going on satisfactorily. The Apparel News: Why do you say that it’s fantastic or excellent? Dr. Md. Shah Alam Majumder: Because, in all aspects, --the machineries, the trainees, the trainers, the management and also the PPE (personal protective equipments) they are using here and the decoration of the training center— everything is fine, and that are compliant with our BETB Standard.